Celebrity Product Placement, Where Are You Going? Product placement is increasingly common and frequent nowadays, products and brand logos can be easily found everywhere, from Coca-Cola's giant red cups with top icons sit behind in “American Idol”, to the Apple iMac used by Anne Hathaway in “The Devil Wears Prada”, and various products in many other occasions like music awards, film festivals, charity events, sport events, etc. Figure 1. 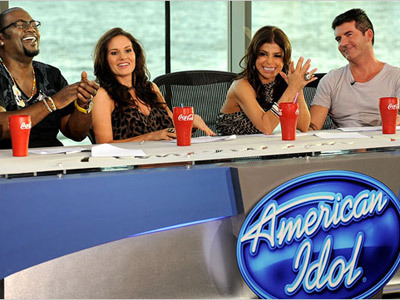 Coca-Cola in American Idol Figure 2. iMac in the movie “The Devil Wears Prada"
But how about traditional commercials? Imagine when the leading actors in your favourite teleplay are about to kiss, an advertisement pop up, what do you want to say? Damn? Or something worse? Nowadays, traditional advertisements are struggling with great difficulty in getting consumers’ attention due to the annoying pop-up form, and in gaining consumers’ trust. Obviously, traditional commercials have lost luster, as both the ratings and effectiveness declined precipitously. According to research data, 90% of people would skip TV commercials when using digital video recorders (Williams, Petrosky, Hernandez, & Page Jr, 2011). On the contrary of the decline of traditional commercials, a new kind of advertising, product placement, emerged rapidly. Although there is a problem of measuring its effectiveness precisely, the fact that product placement is a fast growing industry is indisputable (McDonnell, & Drennan, 2010). Some scholars believe that product placement, as a cost-effective method to reach target consumers, is likely to eclipse traditional advertisements (Russell, & Stern, 2006). According to the result of research, product placement contributes to boosting brand awareness, raising brand affinity and encouraging prospective purchasers (Williams et al., 2011). To be more specific, 60% of viewers claimed that they felt more positive about brands which they recognized in product placement, and 45% said product placement would contribute to their purchasing decisions (Williams et al., 2011). The definition of product placement in the Business Dictionary is "an advertising technique used by companies to subtly promote their products through a non-traditional advertising technique, usually through appearances in film, television, or other media" (product placement, Business Dictionary). According to Balasubramanian (1994), product placement is a paid product message aimed at influencing audience by the planned and unobtrusive implantation of products into carriers. Why is this new ad format so popular? The main reason lies in that product placement as a kind of recessive advertisement, its natural and unobtrusive way of advertising leads to lower audience resistance in comparison with traditional commercials. There is a classical description of product placement, “When is an ad not an ad? When it is a product placement” (Neer, 2004, p.3). The reason why audience have a positive reaction can be that viewers are watching voluntarily with positive feelings, which contributes to their attitudes to advertisement senders (Roelofs, Ketelaar, & Gisbergen, n.d.). Although product placement has long been considered effective, some problems gradually emerged in recent years. The major problem is that consumers started to see product placement as something untrustworthy as they know that the appearance of brands and products was paid by advertisers in advance. According to the attribution theory of Kelley and Michela (1980), which is the theoretical basis of interpreting audiences’ motivational variables and motivational activities, the persuasiveness of a message was weakened sharply when message receivers infer that message senders have prejudices. This can be used to explain the phenomenon that product placement is suffering from the bottleneck of efficiency decrease, and also can be one of the reasons why an important branch of product placement, celebrity seeding, is expanding rapidly. People are not always sure if celebrities are being paid for showing products of certain brand in public or they are going in just because of their personal preferences. There are also many other reasons contribute to the emergence of celebrity product placement. One noticeable reason is the rapid development of social media, like Facebook, Instagram, Twitter, etc . which radically changed our ways of living and socializing. This offers a variety of ways for advertisers to reach target audiences directly, pictures or videos uploaded by celebrities, photographs taken by the paparazzi, our lives are bombarded by these kind of things nowadays. Another major reason lies in that we are living in such a celebrity-obsessed society (Gregory, 2008). People are curious about the lives of celebrities, and enjoy following what they are eating, using, wearing, etc. Such a celebrity-obsessed social value encourages both the media and advertisement senders to make celebrities become a main focus in the messages. Based on personal charisma, celebrities, recognized as thought leaders and trend setters, do have great influence on brand awareness and consumer purchasing decisions. Celebrity endorsement is an officially agreement when celebrities endorse brands or products, whereas celebrity seeding is gifting products to celebrities (Celebrity Seeding And Endorsements, n.d.). As presented in Schuck‘s blog post (2009), celebrity product placement is kind of an “influencer-marketing” approach that contributes to increase brand competitiveness in the crowded marketplace. Although celebrity product placement has long been considered as a clever way for recessive advertising, it has some downsides, like the persuasiveness suffers from lacking of manipulation and negative character associations (Cowley, & Barron, 2008). Besides, it is an undeniable fact that the emerging online social networks do change the platforms and ways of advertising. Therefore, it is necessary for advertisers to make responses and innovations to adapt to the changing market environments. The secret of celebrity product placement is that instead of the overt, paid-for method in traditional celebrity endorsement commercials, it appears more like a personal choice based on celebrities’ individual preferences. Consumers are not always sure that if celebrities are making money. For example, there are even some debates about whether or not Kristin Cavallari was paid by a bottled water company while showing off her engagement ring with holding the drink in hands obviously. However, consumers nowadays are well known of how this kind of advertising method works, and they have been used of many product placements implanted through “traditional” high-profile celebrities. This kind of saturation may triggered negative effects. Along with the emergence of online social networks, “influencers” like internet celebrities, instead of traditional high-profile celebrities, are going to be the new favorites of celebrity product placement. The main problem lies in celebrity product placement is that consumers nowadays see traditional celebrities as advertisement senders, making the persuasiveness and effectiveness suffer a lot. Consumers do not trust traditional celebrities anymore, instead, they trust their own friends and relatives, who cannot exert great influence on a number of people and definitely cannot be a good choice of advertisers. Then how to gain customer trust in this circumstance? The solution is choosing something between, say, social media influencers. This new method of celebrity product placement can be seen as a form of influencer marketing. According to Forbes(2016), the definition of influencer marketing is “a non-promotional approach to marketing in which brands focus their efforts on opinion leaders, as opposed to direct target market touchpoints.” Research data shows that 92% global consumers indicated that they trust earned media sources, for example recommendations from friends or relatives, and word-of-mouth marketing, more than all other forms of advertising, and 88% of consumers trust online reviews as much as personal recommendations (Orendorff, 2016). Influencers in this meteoric rise of advertising can have a social reach as little as 1,000 followers in Instagram. Although it is much fewer than audiences of traditional high-profile celebrities, product placements placed through social media influencers can produce greater effects. Because the level of engagement, authenticity and creativity offered by influencers cannot be matched by the traditional, individual superstars, despite the huge follow teams behind them (Audunsson, 2016). People weigh outside sources above all other kinds of advertisements and sales campaigns, even if they do not have a tight personal relationship with influencers. Social media influencers appealed followers by the original content they post before, which has built up trust and make connections between themselves and audiences. And the key method of gaining and maintaining consumers’ trust is aligning products or brands with people they already trust. Besides, celebrity product placement implanted by influencers is more targeted. Although with a smaller audience, it can reach “right” audience more directly and precisely. This new breed of taste-maker is willing to reach a specific audience group and a market segment after thorough analysis and proper match, instead of targeting the entire market as a whole. The research data of a study conducted by PQ Media indicates that, truly, television product placements used to be the dominant choice of marketers, accounting for 71.4% of global spending in 2006 (Schiller, 2007). However, along with the booming development of social media, although traditional media platforms, such as television, are still playing major roles in celebrity product placement, marketers and advertisers nowadays are shifting from traditional platforms to a variety of alternative social media platforms. According to the survey conducted by the Pew Research Center, while Facebook remains to be the most popular social media website with a gradually decreased growth, other social media platforms saw significant increases in usership (as for the proportion of online adults who use the social media websites, the proportion of Pinterest users raised from 20% in 2012 to 28% in 2014, the proportion of Instagram users increased from 13% in 2012 to 26% in 2014) (Duggan, Ellison, Lampe, Lenhart, & Madden, 2015). Online social networks do rapidly change our daily life and socializing ways. Social media has grown to be a cross-age and daily-used users generated platform. Most internet users are using two or more social media platforms, and half of all them use these websites daily (Duggan et al. 2015). The benefits of placing celebrity product placement in social media platforms are not only limited in making use of the huge number of users gathered by these platforms, but also increasing the effectiveness of advertisements. The analysis of different social media platforms users shows that, since 2014, 56% of all internet-using adults older than 65 years old are using Facebook, whereas 53% of online adults ages 18-29 are using Instagram (Duggan et al. 2015). Besides, female users dominate Pinterest, that it was used by 42% of online female users, compared with 13% of online male users. Apart from age and gender, marketers can make deeper analysis about the nature of social media users. For example, over 50% of Internet users with college educations are using LinkedIn since 2014(Duggan et al. 2015). Obviously, matching product placements with suitable social media platforms in accordance with the nature of products, users, and platforms is a cost-effective way of advertising. Besides, to some extent, implementing celebrity product placements in social media platforms contributes to solving the problem that the effect of celebrity product placement cannot be measured. Marketers and advertisers can assess the effect by analyzing figures of reading, shares, comments, etc. Thus, all these mentioned above makes celebrity product placement in social media platforms more targeted and more effective. In closing, celebrity product placement still works and is still emerging, but it needs revolutions along with the time and market environment changes. We should make every effort to adapt to everyday change of marketing and advertising, and combine other suitable marketing tools as well.